We are delighted to launch the Call for Papers for the 2019 ASET conference, and to announce that booking for conference is now open. Our conferences are renowned for being participatory and providing delegates with many opportunities to find out about new initiatives, projects and good practice, and this year will be no exception. Conference 2019 will consider our role in Supporting Students in Times of Change. Conference will include keynote presentations, discussion sessions on the conference theme, and updates from ASET on the pressing issues you need to know about. Workshop sessions will be approximately 45 minutes long and should be designed to be participatory in nature – the presentation element of the workshop should be no longer than 20 minutes, allowing for discussion and activities to follow. Sessions for research papers will be approximately 45 minutes long and any presentation element of the session should be no longer than 30 minutes to allow for colleagues to ask questions and discuss the research presented. Posters are welcome for display in the main circulation area, where conference refreshment breaks will be hosted. Delegates will be invited vote to award a prize for the best poster. Further Conference updates will be available here shortly. The 25th ASET Annual Conference, welcomed more than 170 delegates to University of Nottingham, Jubilee Campus. See brochure here. Our membership were as generous as ever in sharing the good practice that goes on in their institutions, a fact that was remarked on by the many delegates who joined us for their first ever ASET conference. Conference saw the release of two new Viewpoints, on troubleshooting and crisis management, and through the offer of five professional development taster sessions conference sent our delegates into the new academic year feeling more informed, confident and energetic! Conference opened with a University of Nottingham welcome from Dr Paul Greatrix, Registrar, followed by Keynotes from Jane McNeil, Executive Dean for Learning and Teaching, Nottingham Trent University, reminding us all that the future doesn’t get done to us: we help to make it. Lizzie Brock and Amirah Hajat from our partners at RMP Enterprise gave us exclusive insights into what students are really thinking and feeling, taking us into our ASET Bursary Project Presentations presented to a packed auditorium. Congratulations to both students for excellent work. The day concluded with Parallel sessions, and delegates reflected to on the issues raised in their Regional Hub groups, led by ASET trustees. Day two began with our ASET on.. the Future of Work, with ASET Chair Sarah Flynn looking at the rapidly changing world of work, including reflections from ASET’s newest Trustees about what work was like when they first were employed, to how different they might imagine it to be when their young children enter the workforce. 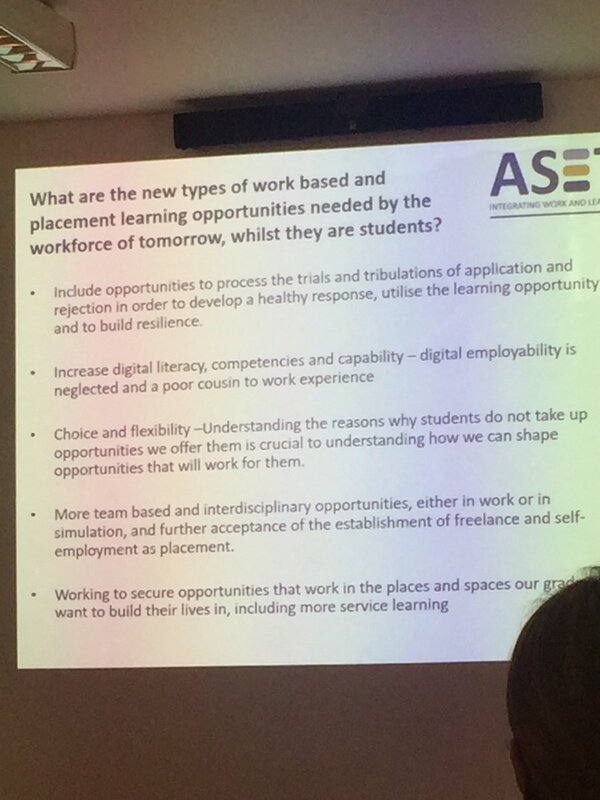 A keynote from Lisa Gray at Jisc, looked at digital skills for tomorrow’s world and our regular panel session opened the conversation to an amazing group of students sharing their experiences with work-based learning. Maddy Woodman and Jordan Funk, Henley Business School, drew conference to a close on Day 3 with a lively and engaging presentation giving us all the start to the new academic year we needed. Thank you to all our speakers and guests. And thank you too to ASET Trustees helping to ensure your ASET conference continues to be unmissable. Proceedings form the 2018 ASET Annual Conference are now available to download .